The Lefevre Gallery (Alex. Reid & Lefevre, Ltd.), London (by 1937). Anon. sale, Sotheby & Co., London, 17 July 1946, lot 32. Mrs. David Metcalfe (Alexa Korda); sale, Sotheby & Co., London, 14 June 1962, lot 15. Anon. sale, Christie's, London, 1 July 1999, lot 831. Anon. sale, Nagel, Stuttgart, 23 October 1999, lot 948. Anon. sale, Koller, Zurich, 7 June 2000, lot 66. Anon. sale, Sotheby's, New York, 8 November 2001, lot 132. J. Rewald, Paul Cézanne, The Watercolours, A Catalogue Raisonné, Boston, 1983, pp. 141-142, no. 238 (illustrated). London, The Lefevre Gallery (Alex. Reid & Lefevre, Ltd.), Cézanne, Derain, Vicky, Guy Marson, December, 1937, no. 1. London, Tate Gallery; Leicester, Museum and Art Gallery and Sheffield, Graves Art Gallery, Paul Cézanne, An Exhibition of Watercolours, April-May 1946, p. 8, no. 42. Aix-en-Provence, Galerie Lucien Blanc, Exposition d'aquarelles de Paul Cézanne, July 1953, p. 16, no. 4. Trento and Rovereto, Museo di Arte Moderna e Contemporanea, Montagna, Arte, scienza, mito, da Dürer a Warhol, December 2003-April 2004, p. 452 (illustrated in color). The Philadelphia Museum of Art, Cézanne and Beyond, February-May 2009, pp. 173 and 532 (illustrated in color, pl. 32). As the most prominent feature of the landscape around Aix, jutting high above the plain to the east of the city, the Mont Sainte-Victoire captivated Cézanne throughout his career. Joseph Rischel observed, "It concerned Cézanne's identity, of course: he felt himself to be this pays d'Aix, that mountain. But it was also a matter of life and death: that is to say, the triumph of life over death, through an art powerful in its engagement with nature and an art dense in matter, rich in chiaroscuro, vibrant in color, passionate in feeling, and which endures in Cézanne's signature motif" (Cezanne in Provence, exh. cat., National Gallery of Art, Washington, D.C., 2006, pp. 289-290). 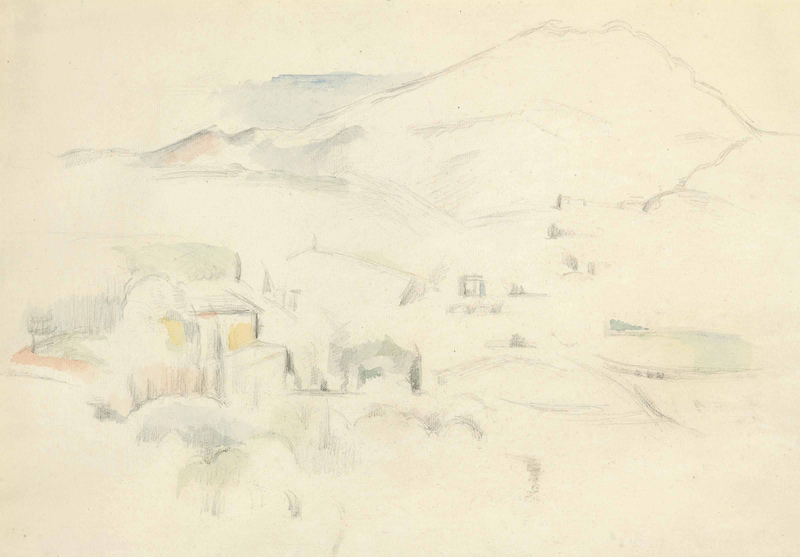 In the 1880s, Cézanne made around twenty views of the mountain from Bellevue--a hill to the southwest of Aix where his sister owned a farm. Heavily influenced by the classical tradition of Nicholas Poussin, these paintings depict a panoramic view over the verdant valley of the River Arc. Trees function as a repoussoir device, and the mountain itself closes the sweeping vista in the back. John Rewald has written, "the pencil has put into place the essential features, to which the brush has added a few accents of discreet tints here and there, generally leaving areas of white paper to enhance their interplay" (op. cit., p. 142). A decade later, forsaking the bucolic naturalism of the Bellevue sequence, Cézanne painted a series of romantic and expressive views of Mont Sainte-Victoire from the isolated grounds east of Aix, the area of Bibémus quarry (see lot 146) and the Château Noir. In these paintings, Cézanne has drawn much nearer to the base of the mountain, and the peak seems to surge up in close proximity. Finally, in the paintings from Les Lauves, the artist returned to a distant view of the Aixois landmark.